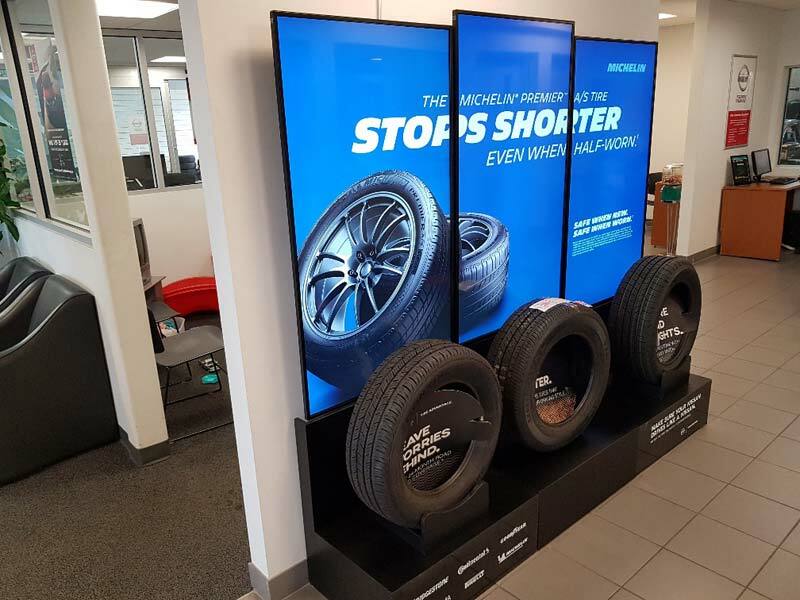 Groupe Touchette, a Canadian-owned distributor of automobile tires, has installed interactive point-of-purchase (POP) digital signage stands from iGotcha Media at nine Nissan/Infiniti dealerships across Canada. Conceived by iGotcha Media, the theme of the Groupe Touchette campaign is the four driving seasons and how the right tires can enhance the experience. The content is inspirational, advisory (tips on inflation, rotation, and alignment), and promotional. The digital interactive studios integrate hardware (monitors, PCs, custom-made mounts and stands) and proprietary content management software that allows clients to manage content quickly and easily from any location. According to Adelstein, the challenge was to develop a unique POP digital display that showcases select products and helps convert passers-by into purchasers. The wall stands comprise three 1.4-m (55-in.) 4K monitors, configured in portrait mode, above three tire holder display cases. 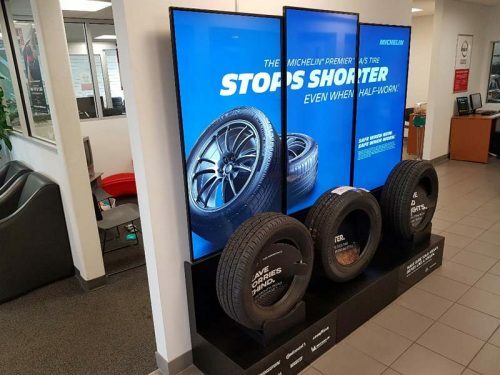 Wall stands run dynamic video content, including a welcome message personalized for each dealer, information on Nissan/Infiniti’s ‘Tire Advantage’ program, and content specific to various tire manufacturers. Wall stands are currently running at Ajax Nissan and Oakville Infiniti in Ontario, Rallye Motors Nissan in New Brunswick, and Spinelli Infiniti in Quebec. 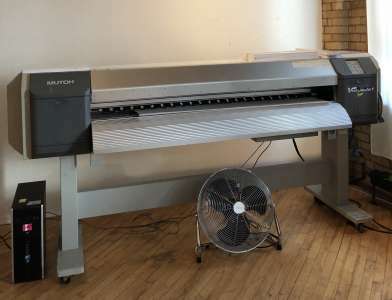 Groupe Touchette’s floor stands integrate three 0.8-m (32-in.) monitors with display cases that position tires on top of the monitors while running dynamic content that simulates three different types of terrain. Floor stands are currently operating at Country Hills Nissan and Hyatt Infiniti in Alberta, H Grégoire Chomedey Nissan and Spinelli Nissan in Quebec, and Kelowna Nissan in British Columbia.